Are you thinking of buying your wedding dress online? Or do you know a bride that is tempted? So you don’t want to spend lots on your wedding dress; the vast online galleries of ridiculously cheaply priced wedding dresses are catching your attention right? Have you seen a lovely wedding dress on line and the image is amazing, perfect just what you would love and the best part is the price tag of £69! Yes that’s right £69 for your wedding dress and then add delivery = a bargain right? To counterfeit means to imitate something. Counterfeit products are fake replicas of the real product. Counterfeit products are often produced with the intent to take advantage of the superior value of the imitated product. Think about this - would you buy a counterfeit or fake iphone? Would you buy a fake piece of Jewellery for your wedding day? Then why would you buy the one item that everyone will be waiting to see you wear FAKE? There are many online businesses trading outside the UK selling via the internet fake copied counterfeit bridal gowns to brides around the world. Most counterfeit goods are produced and manufactured in China, making it the counterfeit capital of the world. In fact, the counterfeiting industry accounts for 8% of China's GDP. Interesting isn’t it! 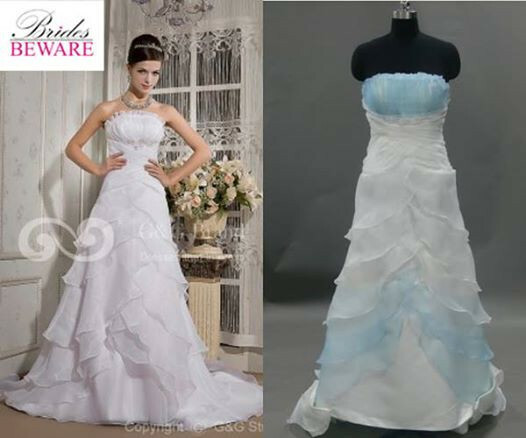 A copyrighted image of a dress by a reputable bridalwear designer is used on the counterfeit website. Brides see this image and order what they believe to be the real dress. The price of the dress is often too good to be true and hard to resist. In fact what they will receive is a copy of the dress pictured. Using drastically inferior quality fabrics and very poor workmanship with a bad fit. The dress will often arrive in flimsy packaging and not have the shipping or taxes paid correctly. Think about this; if the image of the dress had the word ‘Fake’ stamped across it in red then would it still be as enticing? I doubt it as fake good are illegal and against copyright. The counterfeiters set out to intentionally to make money by deception, deliberately assuming the identity of an already established and reputable manufacturer. Legitimate bridal designers and labels that manufacture wedding dresses will showcase their gowns in bridal boutiques so brides can see, try on and get help & advice. You wont receive any of this online let alone be able to try it on! Featured in the Fake Britain series on BB3 this highlights the wedding dress counterfeit culture! Wedding dresses can be as expensive or inexpensive as you choose. Each bridal shop will have different labels which can vary in price from a couple of hundred pounds to a few thousand pounds. When you visit a bridal shop it might be a good idea to contact them first to check what their price ranges are. There are bridal shops that specialise in dresses that are ex sample ore even pre loved. There is even a selected range of bridal on the highstreet. At Alison Jane Bridal there is a section especially for bridal wear between £340 and £550 and that is a brand new dress that will be ordered in your size! General bridal prices from £340 - £1300.